Columnea gloriosa, better known as the goldfish plant, derives its name from the orange blossoms that many say look like goldfish. This plant is usually grown in a hanging basket. It can produce red, yellow and gold blooms on vines that can be up to three feet long. There are over 30 different species of goldfish plants. While most goldfish plants have thick dark green leaves, others have hairy leaves. Some goldfish plants also have beautiful variegated leaves. Most leaves are between two and three inches long. 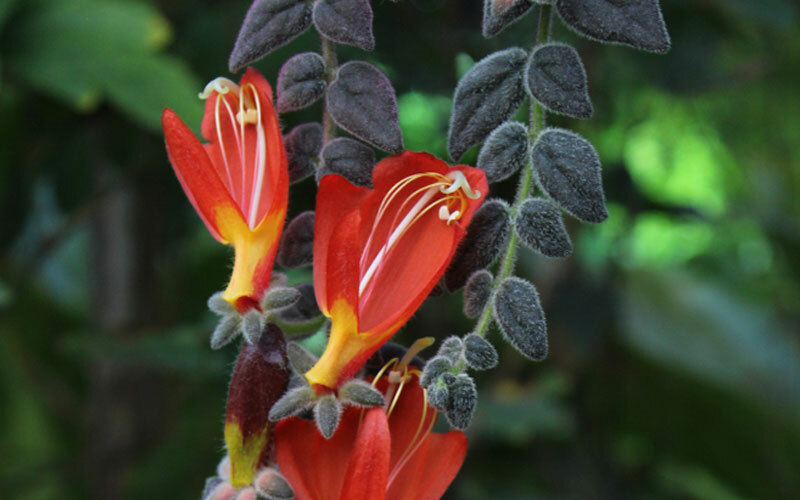 This plant may also be called the lipstick plant or candy corn plant because of its bright colorful flowers. The goldfish plant takes all its nutrients in through the air, instead of through its root system. This fact makes this plant a little more difficult to manage than many other houseplants. This plant needs a light coarse soil for its roots. This plant does not like to stay wet, so the soil needs to drain well. While some have moderate luck growing it in sphagnum moss, you will have better luck growing it in a mixture of equal parts sphagnum moss, vermiculite and perlite. The goldfish needs around 13 hours of direct light every day to bloom prolifically. Therefore, it is usually best grown under grow lights. Be cautious though, placing your goldfish plant in direct sunlight can cause the leaves to dry out and die. Depending on your conditions, an eastern window may do except during the winter months. For beautiful blossoms this plant needs enough light to thrive. The goldfish plant thrives between 65 and 75 degrees. If the plant gets too cold, it will drop its leaves before eventually dying. This plant loves humidity. You will have the most success growing it near a humidifier or a humidity tray. You need to take the time to mist its leaves daily with room-temperature water. Many growers find that a goldfish plant not getting enough humidity is the reason that it does not thrive. Keep your goldfish plant evenly moist allowing only the top two inches of soil to dry out before watering it again during the growing season. When the plant goes dormant, then water only when the soil is completely dry. This plant should be watered from the bottom using a plant tray. Getting water on its leaves can cause brown spots or the leaves to droop. This variety of plant needs a high phosphorus fertilizer, such as a 10-30-10, every two weeks from the time the first buds appear until it is done blooming. 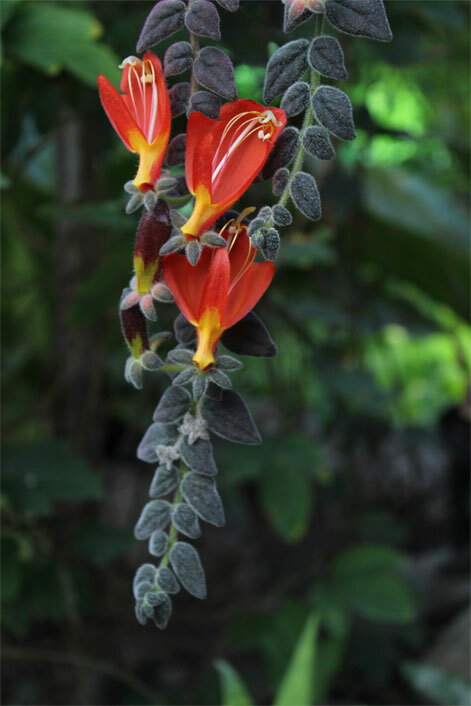 Regularly fertilizing this plant will encourage its blooms to stay longer and more blooms to appear. Apply the fertilizer at half strength. Then, you can reduce the amount of fertilizer to once a month during the plant’s dormant period. Goldfish plants have roots that are only about three inches long. Therefore, there is no need for a deep pot. Instead, choose a pot that allows the plant to spread vigorously. Since these plants send off long stems that can be over three feet long, a hanging basket is a great solution. This plant should only be pruned once a year in late winter. Trim back the stems until they are about 18 inches long as this encourages them to produce more stems. The result is that the plant looks fuller, and it produces more blooms. The goldfish plant needs to be repotted every two years. They should be repotted in March or April. Fill the new pot with a mixture of African violet potting soil with some perlite. Or create your own combination using equal parts of perlite, sphagnum moss and vermiculite. Carefully remove the plant from its old pot. Use warm water to wash all the soil off the roots. Then, trim away the bottom third of the roots using sterilized scissors. Place the plant in the new pot at the same level as it was in the old one. Remember that this plant likes very shallow pots. The Goldfish plant does well when leaf cuttings are made to create new plants to share with your neighbors or friends. Start by preparing a pot that has equal parts sphagnum moss and vermiculite in it. Add a little rooting hormone to the soil following the manufacturer’s directions. Take a cutting off the end of a stem that is about four inches long and contains at least two leaf nodes. As with other goldfish plants, keep it where the temperature stays above 65 degrees Fahrenheit and below 75 degrees Fahrenheit. Once you notice new growth, then water the plant and fertilize it every two weeks. As long as you carefully control the amount of light, temperature range and humidity levels, the goldfish plant usually has very few problems. Plant lice, mealworms and spider mites can cause plants to lose leaves. Try treating the plant with a natural insecticide. Legginess often occurs when the plant is in a pot that is too big for it. Try repotting in a smaller pot. You may also want to move the plant to a location where it gets more light. Pinching back the plant after it stops blooming helps to stop legginess. Leaf dropping and browning can be a sign you are over-watering the plant. It should only be watered from the bottom using a watering tray so water does not get on the plant’s leaves. You may also want to check to make sure that the plant is not getting too hot or too cold throughout the day. Goldfish plants are not poisonous to dogs or cats making them the perfect plant for pet owners. If you are looking for a light-loving plant to grow in a hanging basket, then the goldfish plant may be the perfect solution. This plant does well in temperatures found in most homes, and it loves humidity. You can get one from many nurseries, but it is also easy to start it from stem cuttings. Keep this plant that is a cousin of the African violet in similar growing soils, and it will thrive for up to a decade. Watch for common problems telling you that water is getting on the leaves or that it needs its temperature moderated more closely. This nontoxic plant is a wonderful addition to many homes.